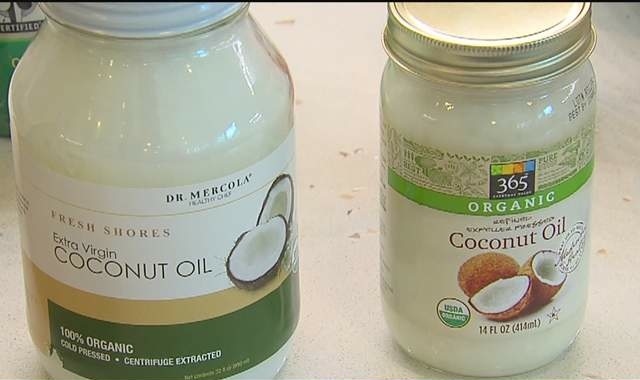 I was interviewed recently by ABC News about the health benefits of coconut oil. A long time fan of this tropical oil, I was excited to share all the wonderful ways I’d found to incorporate coconut oil into my cooking and beauty routines. I like it so much and believe in it’s health benefits that I’ve even started giving it to my dogs in these treats. Here’s the lowdown on why coconut oil is good for you inside and out. Coconut oil contains lauric acid, a medium chain triglyceride that promotes ideal HDL cholesterol levels and better cholesterol levels overall. Coconut oil is also beneficial in helping maintain a healthy weight because the breakdown of the oil’s fatty acids in the liver causes an increased metabolism. It also supports normal hormone levels and proper thyroid function. Boosts your immune system, fighting off bacteria and viruses. Balances yeast and candida levels in your system. Improves brain function by greasing the wheels. 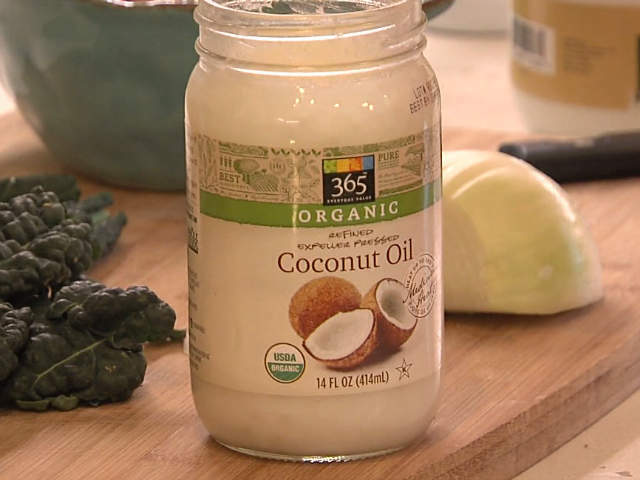 You can use coconut oil when sautéing, grilling, and baking. Be sure to use only organic coconut oil. You don’t want the pesticides and other toxins to negate the awesome health benefits that coconut oil offers. Coconut oil is sold either refined or unrefined. Unrefined coconut oil offers more health benefits because it is only minimally processed when the oil is extracted from the coconut meat. Refined coconut oil still offers many health benefits, but because it undergoes more processing, some of the nutrients are stripped from the oil before it is jarred. You should use unrefined coconut oil if your recipes call for sautéing or baking at a temperature of 350 degrees or less. For recipes calling for a cooking temperature higher than 350 degrees, use refined coconut oil. If you like cooking spray, try this one. This is one of my favorite, healthy recipes using coconut oil – Feel Good Chicken. I’ve also started adding a teaspoon or two of coconut oil to my coffee in the morning. With a dash of stevia and swirl of the spoon, you’ll have a rich morning pick me up that tastes like a treat and keeps you filled up until lunch. If the oil in your coffee is too much to handle, consider swapping your dairy-based creamer for unsweetened coconut milk. You’ll get the benefit of the healthy fat with a smoother, more traditional taste. Use it as an eye makeup remover. It’s a chemical-free way to take off makeup, condition your lashes, and nourish the delicate skin under your eyes. Use it as a cuticle softener. Add raw sugar and use it as an effective, nourishing body or hand scrub. I especially love using this before an event where I’ll be shaking a lot of hands. Add baking powder and use it as a lip exfoliator. Consuming coconut oil offers many of the same health benefits for dogs that it does for humans. I’ve started adding it to my dogs’ food every morning. As with any change in their diet, it’s better to do it gradually as to not upset their system. Start out by adding a teaspoon and work up from there. My dogs weigh about 60 pounds, and I give them a tablespoon each. I also give them these treats. Alleviating allergic reactions to pollen and other environmental stimulants. Growing a soft, thick, glossy coat. Whether it’s for you or your furry one, coconut oil offers a slew of amazing health perks. Be sure to add it to your grocery list, and you’ll be feeling the benefits in no time. This entry was posted in Wellness on March 10, 2014 by Karena. i moisturize with spectrum coconut oil all winter. i put it in my dogs food bowl.